Around a year ago, Georgia Harper from GHLD came to us with a design that she had in mind for MIFGS 2016 called OHANA. We instantly wanted in and were excited to work in collaboration with Georgia as it was going to be a space that was not only creative and beautiful but also practical. With the level of detail involved, it wasn’t going to be an easy build with the allocated time frame of 7 days but we knew the team were more than capable of pulling it off, and that they did!!! Below is a write up from Georgia Harper from GHLD detailing our work, the design and the incredible sponsors that were involved. A Modern Homage to Mid Century Modern Surf Style. 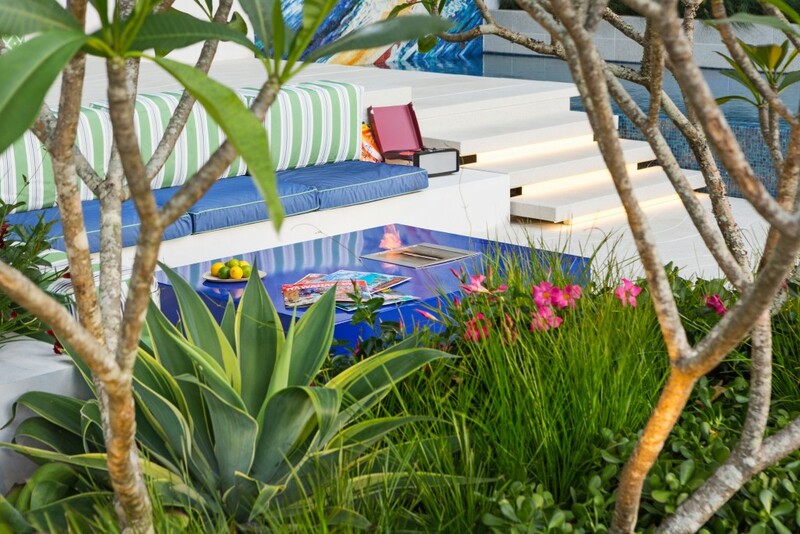 Ohana is a collaboration project for the Melbourne International Flower and Garden Show 2016. 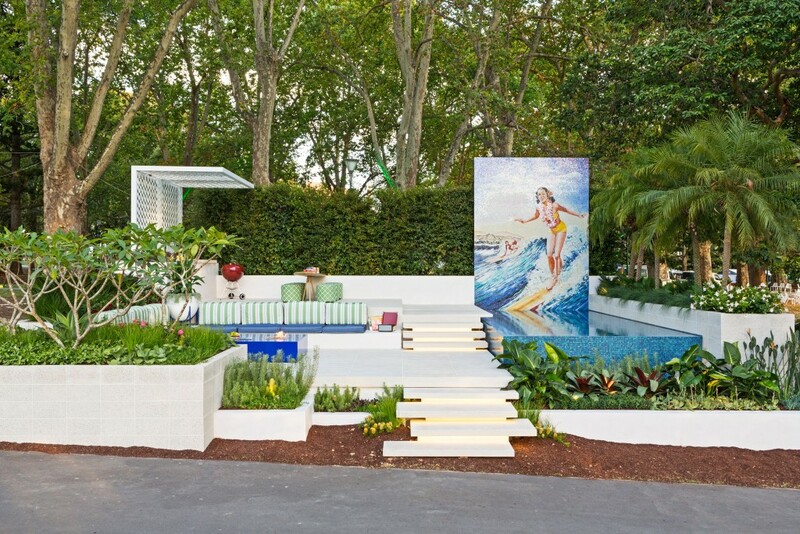 The garden was designed by ghld, and built by The Garden Company and The Pool Company. Ohana was awarded a Silver Medal in the Show Garden category. 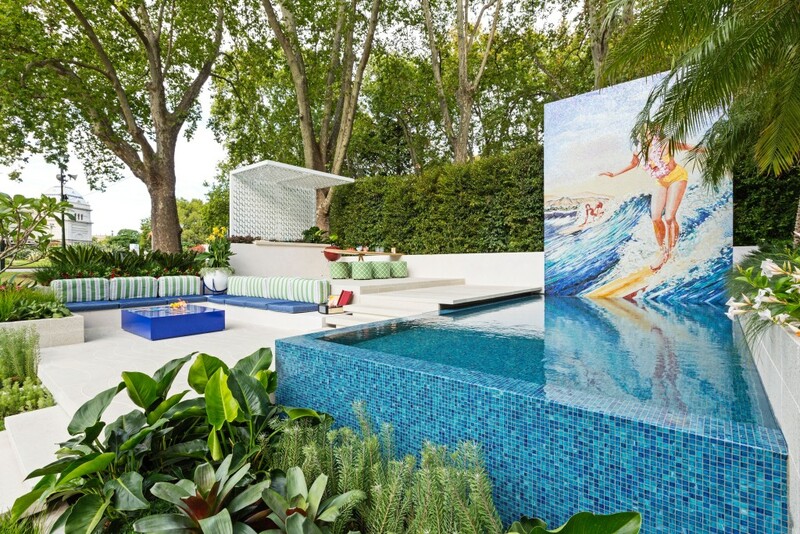 I really want to acknowledge the superb craftsmanship and finish that defined this garden – it was a tricky site and a tough build, and www.thegardencompany.com.au and www.thepoolcompany.com.au did an absolutely superb job. Their professionalism and expertise is second to none. Ohana – loosely translated – means ‘family’, ‘extended family’ and ‘no one left behind’ – so we thought it the perfect sentiment for a space that can be enjoyed by modern families of all kinds and sizes. Echoing mid-century shapes and styles, we were able to put a stylish and very user friendly twist on the modern backyard. We wanted to have some fun with the 1960s surf theme and give it a modern revamp. The site we chose has a significant slope, and changes in height by over 2 metres – so we thought it would be a great site to demonstrate how to harness these level changes, and at the same time make the severity of the site incline less apparent. The lower level is the ‘entry’ level – space for at least 10 people to relax around the coffee table/firepit, and close enough to be able to chat to swimmers in the pool. Cantilevered steps trace the side of the pool and take you up to the dining level. The negative edge on 2 sides of the swimming pool adds drama and a touch of interest (especially when lit up at night), running under the paved areas and connecting them nicely.